I’d driven through the hairpin turn on Highway 2 numerous times but never turned onto the road by Tunnel Creek. Snowplows had shoved a large amount of snow to the side of the highway and blocked off the service road. So parking next to the hairpin turn with less than two cars width was nerve-racking. It never occurred to me that most of us swoosh through this sharp turn! As soon as we got on top of the four-foot-tall snow berm, we began to posthole. After walking the service road for about 100′, I realized there was no point in holding off putting on snowshoes. Somehow I had expected to see more ski tracks and packed snow, but even the most recent tracks looked days old. We walked for another half a mile and crossed the bridge over Tunnel Creek. Then at the first junction past the bridge, we made a left onto a spur road with an open gate. The spur road didn’t show up on the map, but we followed it as it headed toward the ridge. 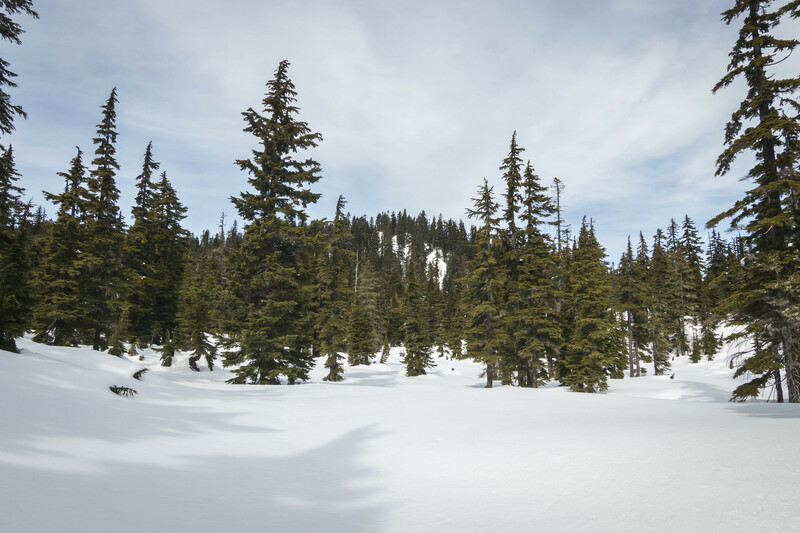 After making a couple of short switchbacks through the brush, we slowly scrambled toward the ridge in soft snow. We stepped out onto a clearing with a giant transmission tower overhead right just below the ridge crest. Before re-entering the forest, we got our last views to both sides, including the imposing north face of K9. We moved at a faster pace in the forest on better snow. Many down trees throughout, but we were able to negotiate with good snow coverage. Views on the false summit at 5000′ were spotty, just glimpses of Cowboy Mountain and Lumiere Ridge to the north. We then moved a short distance east on the ridge and got to the true summit within a matter of minutes. Several openings on the woodsy summit provided views to the top of a handful of faraway peaks. Perfect summit temperature on this gorgeous weather day! With a modest elevation of just over 5000′, Sopwith Camel Mountain was surrounded by taller neighbors. Due to the number of trees on the summit, views weren’t excellent but also weren’t too shabby either. The small opening to the southwest gave an unobstructed view to K9‘s precipitous north face. But the western aspect was just as dramatic as I had observed from our trip two weekends ago. After an enjoyable stay, it’s all downhill from here (no pun intended)! We took advantage of the nice weather to pay the two lakes on the south side a visit. One cool fact about Mig Lake and Hope Lake was that both were next to the Pacific Crest Trail (PCT). Mig Lake sat 300′ higher than Hope Lake and two lakes were less than half a mile apart. The lakes were still frozen and under a layer snow as we snowshoed past them. I wondered how busy this place gets in the summertime when hiking season is in full swing. We exited the basin via Hope Lake’s outlet by the Alpine Lakes Wilderness sign now sitting at the foot level. Initially, I had thought about hiking in the direction of Tunnel Creek Trail. But after about 100′ of steep sidestepping, I realized by doing so the entire way it would’ve been extremely irritating. 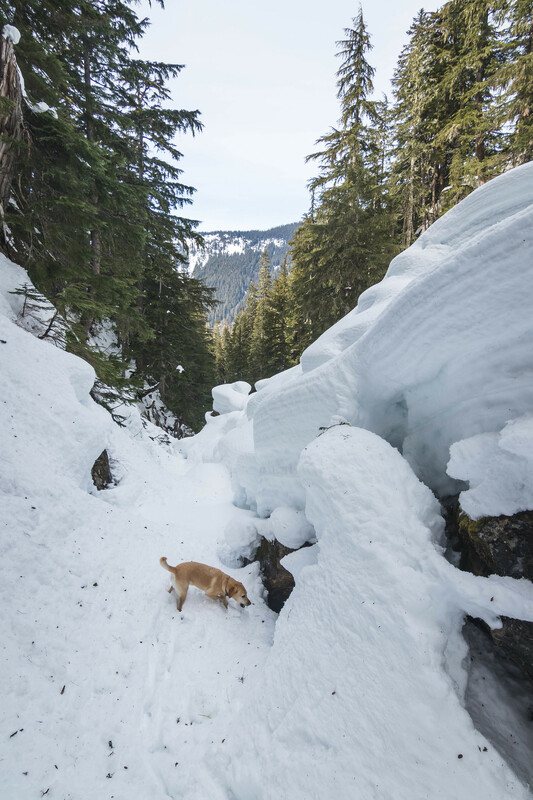 So we dropped down onto the heavily snow-covered streambed and begam to snowshoe downstream. For the most part, we were able to stay on top of the streambed. A couple of sections had a steep drop, and we bypassed them from either side. As terrain began to flatten out, we left the streambed and scrambled back onto the service road. Half a mile later, we picked up our up tracks by the open gate and continued to hike out.